This evening I wasn't in the mood to cook which was good because I had plenty of roasted wild Copper River Red Salmon left from last night's meal since I roasted 2-1/2 pounds of it. I actually enjoyed a leftover piece "cold" for my lunch today...and it was awesome! I also happened to have leftover Buttermilk Biscuits in the fridge from the weekend. As I sat there staring into the refrigerator as if something magical was going to happen and our dinner would magically appear...it did! I looked to the right...a big platter of cooked salmon. I looked to the left...a plate of buttermilk biscuits. I looked at the top shelf and there sat a carton of cream, half-and-half and cashew milk as well as a brick of cream cheese. And then it came to me...Creamed Salmon over Warm Toasted Biscuits! 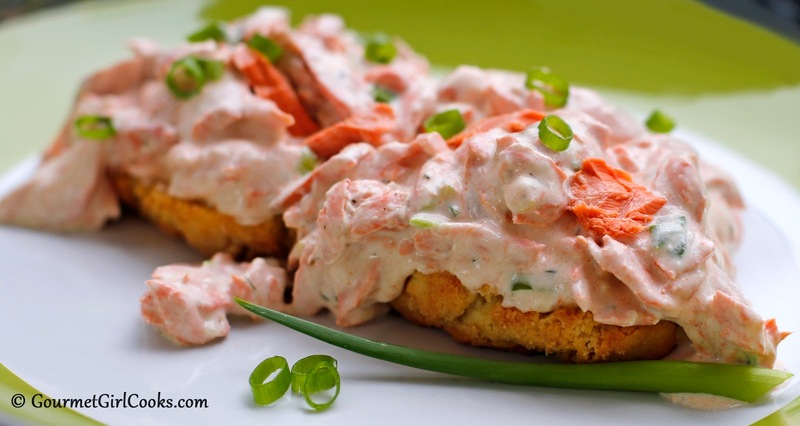 Not just any old creamed salmon either...but creamed wild Copper River Red Salmon! My main focus was to make sure that the Copper River Red Salmon remained the "star of the show." I did not want to mask or overpower it's delicate flavor at all, but simply "gild the lily" so to speak, by lightly coating it in a luscious delicate sauce to be ladled over warm toasty biscuits. There are very few ingredients in this dish and it is rich and "oh so gourmet." It's a perfect way to make an entirely new dish with leftover cooked salmon. Hubby and I actually shared a biscuit...we each had half of a biscuit topped with the creamed salmon. It was rich and satisfying and oh so delicious; a gourmet comfort food of sorts. I actually used a blend of half-and-half and unsweetened cashew milk in my cream sauce (one part half-and-half and 2 parts unsweetened cashew milk) to keep the carbs low without sacrificing any flavor. It was amazing and I have enough left for lunch tomorrow, too! I snapped a few photos below. My recipe for Creamed Salmon can be found below. I served the Creamed Salmon over my sturdier version of buttermilk biscuits that I made this weekend. 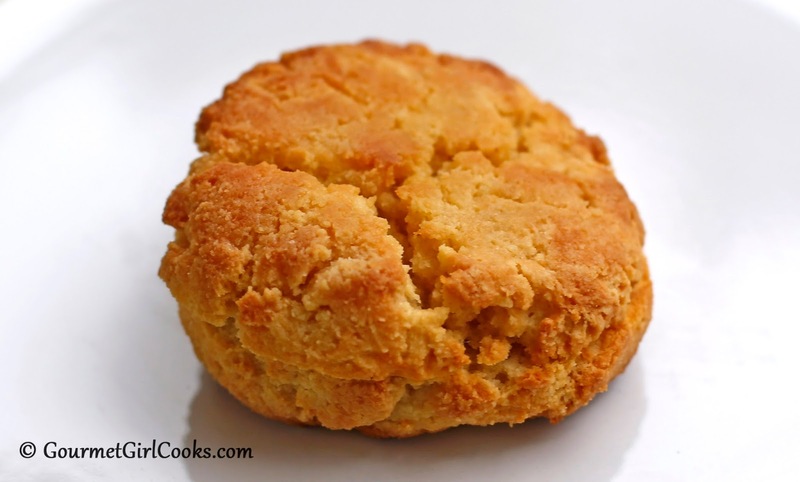 The recipe for the biscuits can be found by clicking here: Buttermilk Biscuits - Sturdy Sandwich Version. Enjoy! In a 10-inch nonstick skillet, melt 3 ounces of cream cheese over low heat, mixing constantly with a heat-safe rubber spatula, until melted and smooth, about 2 minutes. Add 1/4 cup of cream or milk, and slowly whisk into cream cheese until blended. Add sliced green onion and the remainder of the cream, 1/4 cup at a time, whisking until blended after each addition. Season with salt and pepper, to taste. Add dill and taste for seasoning. Add flaked salmon to cream sauce and gently fold in with a rubber spatula. Heat on low just until it begins to simmer (do not boil) and remove from heat. Ladle creamed salmon over biscuits. *Notes: If a thicker sauce is desired, either add additional cream cheese (before adding salmon) or add slightly less cream. If a thinner sauce is desired, add a little extra cream in small increments until desired consistency. 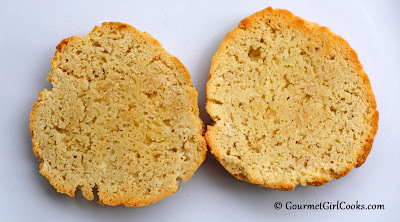 For the liquid, I used 1/4 cup half-and-half and about 1/2 cup unsweetened cashew milk. If desired, add 1 tablespoon of butter to the skillet before adding cream cheese to melt. 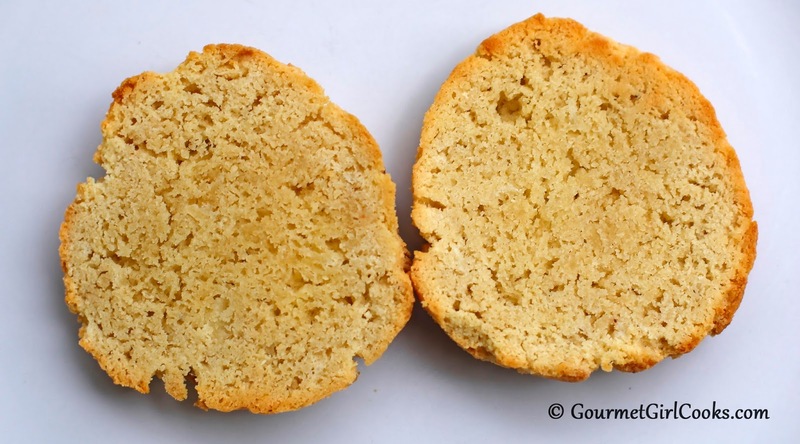 It's best to toast grain free biscuits in the oven at 300-325 degrees F for 5 to 10 mins (split in half before toasting) to prevent them from burning against toaster elements as well as keep them from breaking. This cream sauce recipe would work well with chicken, too. My lunch today was a piece of leftover salmon topped with leftover "creamed salmon"...now how does THAT sound for lunch? LOL Believe it or not, it was really really good. I can't say that I have ever eaten salmon topped with salmon sauce (or any other matching meat, poultry, etc. topped with its own kind). Glad you enjoyed your first Copper River Red this season...isn't the first after waiting all year for it just the BEST? I actually just had the last small piece for lunch of the 2-1/2 lbs I cooked a few days ago. Just in time to get more this weekend...maybe even tomorrow!